So let’s take a break from the Mattycollector hullabaloo with another Captain America: The First Avenger review! It’s day three of our Flags & Spandex week and we’re going to make a jump over to the comic book side line with a look at Captain Britain in his New Excalibur duds. This line’s for all patriotic heroes, even those from other countries. I’m a huge fan of Alan Moore/Alan Davis’ run on Captain Britain. Not only was the writing brilliant, but Davis’ smooth and flowing art style really brought the characters and pages to life. He’s one of my top five favorite artists and damned good writer to boot. If you’re not familiar with his work I highly suggest you pick up The Nail TPB from DC or even Clandestine from Marvel. Both are fantastic stories that are well worth your time and money. Oh yeah, so Captain Britain… Ever since my first introduction I’ve been a big fan of the character. It wasn’t just that he was written well though. I also really like how the character looks. In particular I prefer his second costume with the helmet, but even his first suit has a nice Silver Age appeal to it. I haven’t always followed the character’s books, but I have kept my eye on his costume changes throughout the years. 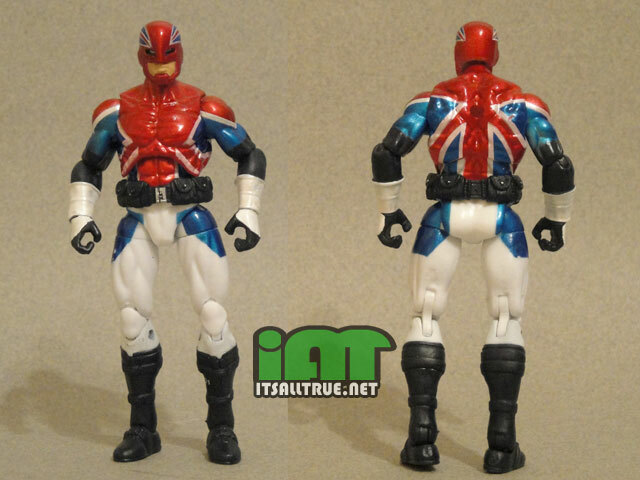 This particular Captain Britain figure is based on his design in the New Excalibur book. I usually start out my reviews with the sculpt of a figure. But this time I’m starting with the paint job because it’s what really grabs your attention right away. 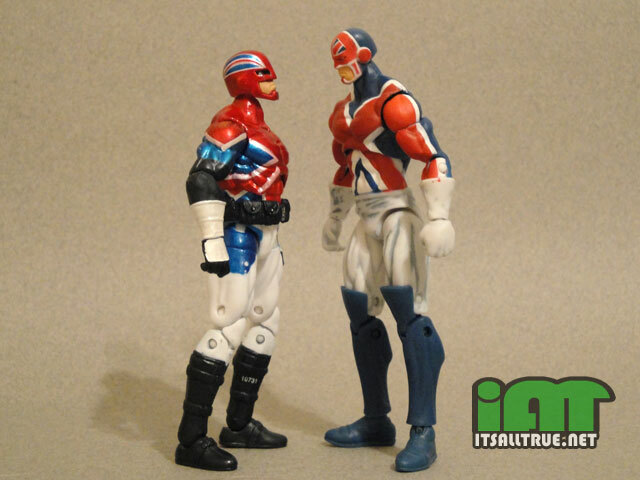 The design is different but still very similar to his previous costume with mostly white pants and the Union Jack emblazoned across his upper torso. What’s so striking about this figure is the use of a metallic paint for the red and blue colors. This not only makes his colored bits pop from the matte white and black, but it also gives his costume an armored look that’s very impressive. Sadly, because this figure ended up in a movie line, the quality of the paint job isn’t always reliable. This was the fifth Captain Britain I hunted down over a month long period whose paint was acceptable enough to buy. Even then, there’s still a pinkish hue to some of his white stripes. The sculpt of this figure is pretty good also. His body has a generic look with most of the sculpted details showing up on his gloves and boots. He’s got a brand new head sculpt showing off the more armored version of his helmet, which I’m a big fan of. He’s also got a belt piece with plenty of pouches, although I’m not really sure why he needs them. The size discrepancy between the MU and Cap Movie figures is striking, but isn’t really problematic IMO, if you’re looking for a comics-consistent way to explain it away for your peace of mind. Captain Britain’s increased muscularity and bulk was a function of activating his powers, originally. That is, he was a regularly-muscled (if already athletic) male normally, but would develop superhuman musculature after vigorously rubbing his “Amulet of Right” (talk about your adolescent power fantasies!). During his first stint with Excalibur, since his powers were always “on” (because of the Amulet of Right being incorporated into his costume) I think most readers (and eventually, even the artists drawing him) came to assume that he was normally all-bulked up under the costume. In recent years, he’s been drawn with less muscular bulk for some reason, and I think it’s those proportions that are reflected in this figure. As a Brit of course I gotta love CB (IT’S Mandatory….) and while this is a nice design it’s pretty much ruined by the shockingly bad paint-apps and awful waxy, semi-translucient plastic that Hasbro normally reserves for Transformers I don’t want them to ruin. 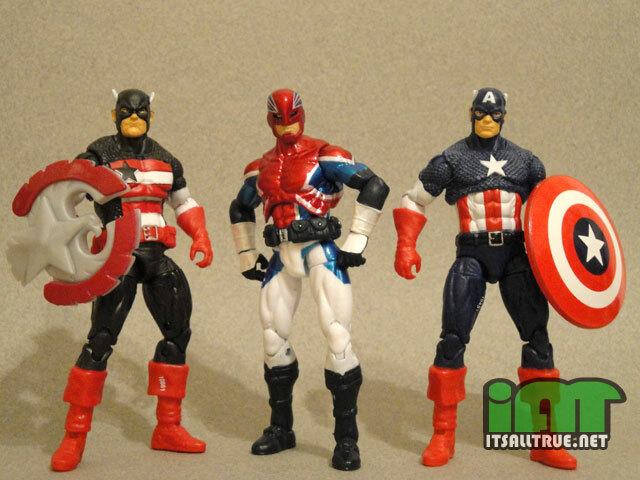 The whole Cap line seems very sub-par when compared to the quality of the IM and Thor lines and I wonder why – you would have thought a basic, movieised Cap would be a huge seller, so why haven’t they made one worthy of the name? There haven’t been paint apps this poor since Googly-eyes Indy back in the first ill-fated wave of his stuff. he looks thick in the middle. like captain britain needs to lay off the extra pint w/ dinner and start going for a job once in a while.